Apps... the edible kind (not the mobile)... are the last thing I think about when I'm thinking about a dinner party (the mobile kind aren't even in the equation). And... even if it's just a nibble and drinks... I'm thinking of something simple. Typically, it's something that has good flavor and... if even one offering... offers another option. Something like the artichoke-onion-tapenade I favor. You can grab a toast and some cheese; grab a toast and some veggies; or, do the whole thing up as a little bruschetta. This little shrimp bite falls into this simple... yet versatile... nibble. It's a great little bite (or two, or three). 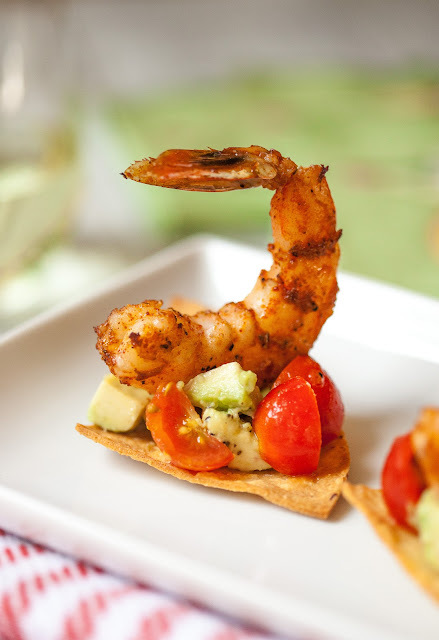 A crisp, home-fried, white corn tortilla wedge topped with a lime-infused chopped of fresh avocado, some salsa'd cherry tomato quarters, and an oven-roasted south-of-the-border-spiced prawn. Put the whole thing together as one presentation; plate up the components separately and nibble a chip with some avocado, or a chip with some tomatoes; or grab a shrimp all on its own. Simple, appealing, versatile.... a good app. Preheat oven to 400 degrees F. Place cleaned shrimp in a bowl. Add olive oil, 1/4 teaspoon salt, 1/4 teaspoon black pepper, cumin, coriander, paprika, and cayenne pepper to shrimp; gently toss to coat shrimp. Arrange shrimp on a baking sheet, in one layer, and roast in oven for 8 to 10 minutes, until pink (8 minutes works for me every time). Place quartered tomatoes into a small bowl. Add salsa to tomatoes, along with a pinch of salt, to taste. Mix well and let sit while you prep tortillas. Heat approximately 2 inches of canola oil in a saucepan, on high. Test heat by immersing edge of one tortilla in oil (using tongs). If tortilla begins to sizzle... you're ready. Drop 4 to 6 wedges into hot oil, turning in oil with tongs to ensure even browning; cook until just golden, 30 seconds to 1 minute, depending on heat. Remove to paper towel covered sheet pan, sprinkle with a little kosher salt. Continue with remaining tortilla wedges. Remove shrimp from oven when ready. Let shrimp cool to room temperature and then drizzle with some freshly squeezed lime juice. 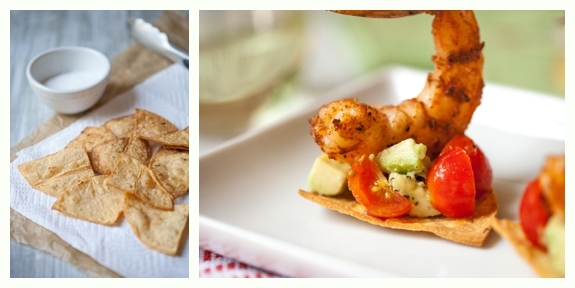 To assemble nibbles, top each tortilla wedge with a spoonful of avocado and 3 or four salsa'd tomato quarters. Nestle one shrimp on each avocado-topped tortilla and serve.